Saturday April 19th 1879 I do not feel well today. Helped with the work however. Hatt went to town for meat in the forenoon. Aunty and Uncle Walker were here for dinner. Hatt went over to Em [Parnins?] to spend the afternoon. I made a house call at Howes. When I came home found Win here. Rob took her home when he went after Hatt. I worked all the evening on my tidy. Sunday April 20th 1879 I was sick all day. Was in bed most of the afternoon. I read a little in the evening. Monday April 21st 1879 I cleaned up the house this morning while Hatt did the washing. I cut carpet rags all the afternoon and knit a little in the evening. 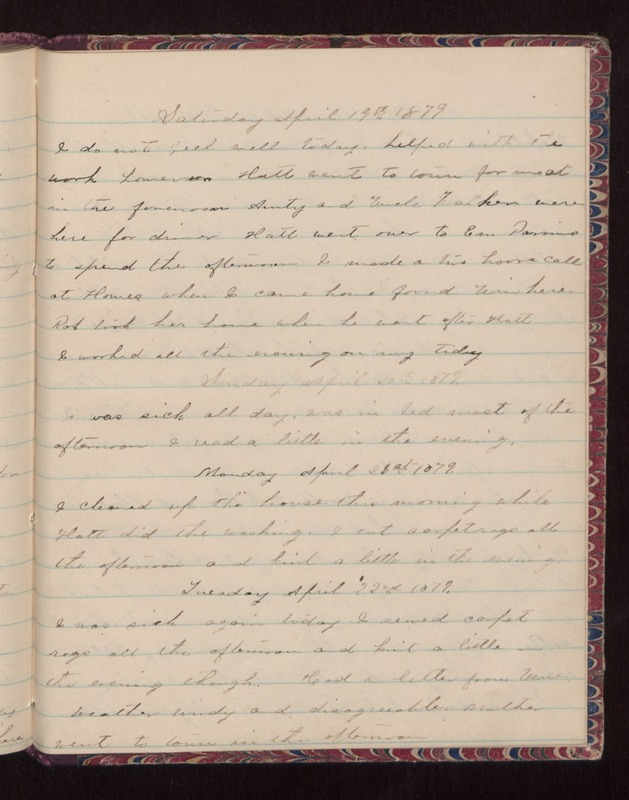 Tuesday April 22nd 1879 I was sick again today. I sewed carpet rags all the afternoon and knit a little this evening though. Had a letter from Verne. Weather windy and disagreeable. Mother went to town in the afternoon.